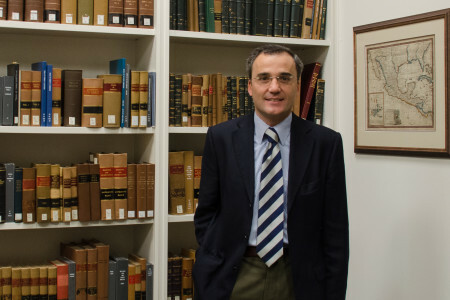 Professor Aniceto Masferrer in the rare books room at the Law Library of Louisiana. serendipity – or providence, as he regards it – played a larger role than planning in his quest to become a law professor and eventually a legal historian. But serendipity or providence alone could not have led him to where he stands now as a prolific scholar with broad research and teaching interests. Professor Masferrer asserts that persistence and a positive outlook ease the way in embracing one’s chosen path in life. In his case, the tools alone for the work in which he is engaged require these attributes in spades. The process of acquiring the range of skills to operate successfully in an international environment, maintain a teaching schedule, write scholarly works in both English and Spanish, and perform research in several languages is not an enterprise for the unfocused or faint of heart. Professor Masferrer graduated with a Licenciatura (Degree of Law) from the University of Barcelona, and received his Ph.D. in law from the University of Girona. His resumé includes visiting professorships at the University of Cambridge (UK), the University of Tasmania (Australia), the Bar-Ilan University (Israel), the École Normale Supérieure (France), and positions as visiting Scholar at Harvard Law School, at Melbourne Law School, and at Louisiana State University Law Center, and Fellow Researcher at the Max Planck Institute. 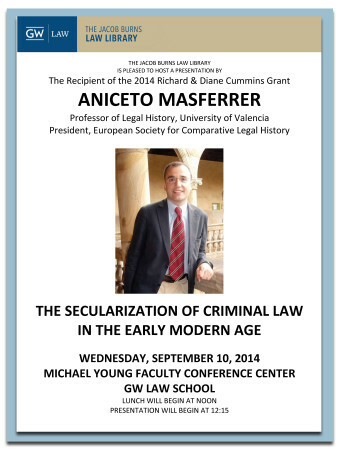 In 2014, he was the recipient of the Richard & Diane Cummins Legal History Research Grant at GW Law, and at the close of his stay delivered a presentation entitled “The Secularization of Criminal Law in the Early Modern Age.” He is the President of the European Society for Comparative Legal History, member of the Spanish Royal Academy of Jurisprudence and Legislation, vice-president of the Fundación Universitas (www.fundacionuniversitas.org), and the Chief Editor of GLOSSAE. European Journal of Legal History (http://www.glossae.eu). Professor Masferrer’s books include Spanish Legal Traditions: A Comparative Legal History Outline (Dykinson, Second Edition, 2012), and he edited Post 9/11 and the State of Permanent Legal Emergency: Security and Human Rights in Countering Terrorism (Springer, 2012), co-edited Counter-Terrorism, Human Rights, and the Rule of Law: Crossing Legal Boundaries in Defense of the State (Edward Elgar Publishing, 2013), and others which will appear next year (Comparative Legal History, by Edward Elgar Publishing; Western Legal Traditions Casebook, by Hart Publishing; Human Dignity of the Vulnerable in the Age of Rights: Interdisciplinary Perspectives, by Springer). 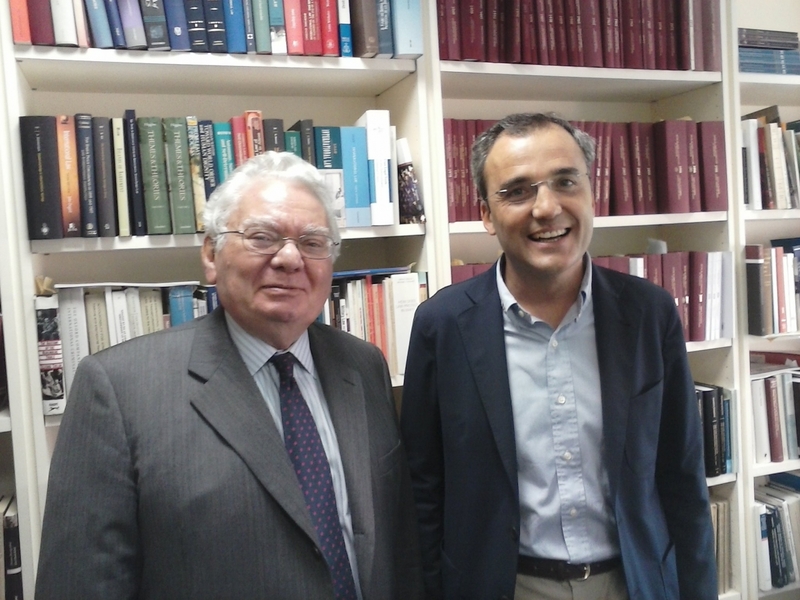 His primary research interests in the historical and comparative aspects of criminal law, the codification movement and constitutionalism (particularly, human rights) are reflected in his sixty-plus book chapters and articles published in Spanish, European, and American law journals. 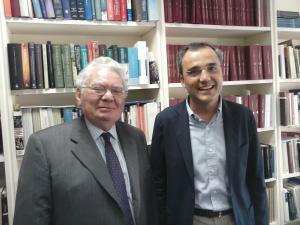 In his interview, Professor Masferrer considers a number of issues, such as the obligations of scholarship and membership in the academy (including the necessity of addressing current issues in mainstream newspapers to explain legal issues to a lay public, and frame possible solutions or approaches), the role of the University, and the enjoyment of one’s chosen work. 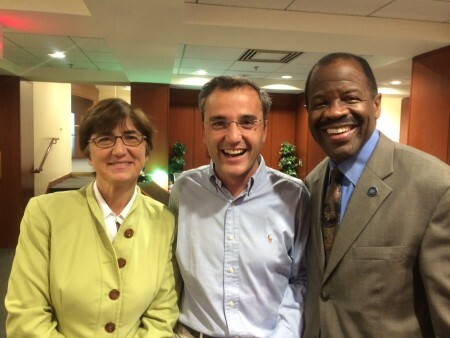 At GW Law: Professor Masferrer flanked by Associate Dean for International and Comparative Studies Susan L. Karamanian and Dean of the Law School Blake D. Morant. A Legal Miscellanea: How did you acquire a more than casual interest in legal history, and when was it clear to you that you would pursue it as your life’s work? Professor Aniceto Masferrer: When I began my law studies at the University of Barcelona (October, 1989), I felt attracted by the possibility of becoming a law professor, but I didn’t take it seriously because I thought I was not good enough for that. After my fourth year (there was still a year left), in August 1993, I had a nice conversation with someone who asked me about my professional plans after completing the law degree. I replied that I envisaged many options and that I needed to consider all of them to arrive at a decision. We were having a pleasant walk in the country. Suddenly he stopped, looked at me, and asked: “But what do you really aspire to professionally?” I replied immediately: “A law professor.” (I did not say “a legal historian.” This came later.) Then he gave me one of the most valuable pieces of advice I’ve ever received: “Just do it. Put your entire being into pursuing that. If you fail, you will never regret having tried. If you succeed, your life will be much happier because you’ll be doing what you are suited for.” I’ve never seen this person again, and he is probably not aware of how momentous this conversation was for me. Anyway, I’m most grateful to him because he was frank and told me what he really thought. It is not easy to come across people like this. I’d say that legal history chose me, rather than the other way around. Sometimes it is better to pay attention to what life brings rather than trying to plan and predict everything to arrive at the supposed “perfect” decision. As soon as I decided to pursue an academic career, I realized there was a reason for abandoning the idea that I was not good enough to pursue such a goal. In my fourth year I had been taught by a lecturer who was so bad that I thought at the very least I could improve upon her performance. I’m very grateful to her on that count. In my fifth year I decided to meet some of the lecturers who were teaching courses. I remember one trying to discourage me from choosing the academic path. He did not succeed at all, because I had already made up my mind, and I knew I needed to be persistent. Legal history as a calling came to me after I sought advice from the professor who taught me legal history in my first year. She listened to me very carefully and with great interest. When I finished, she asked me whether I might be interested in legal history. She told me that she had just received a call from a colleague who needed an assistant at the University of Girona. “I don’t want to push you, but you would have a chance. Take your time, think about it, and let me know.” She thought I’d need some days or weeks to reflect on that, but it was not that long. It took me only a few seconds. Legal history had not been my first choice, but I had enjoyed it in my first year. I thought: if I were able to enjoy it so much as a first-year student, it might be that I’d be able to enjoy it much more as a scholar. I said yes immediately. Fortunately I was right and here I am. I’d say that legal history chose me, rather than the other way around. Sometimes it is better to pay attention to what life brings rather than trying to plan and predict everything to arrive at the supposed “perfect” decision. Did you have experience as a practitioner before your entry into academia? Did you consider the practice of law as an alternative to becoming a law professor? AM: Yes. I did practice law for a short time before I got a Ph.D. fellowship at the University of Girona. After that, I realized that my doctoral thesis should be the priority and decided to focus on that, and gave up my work as practitioner. Once I started working as a scholar and law professor, I never sought to practice law again. I enjoy legal academia much more than practicing law. Students can benefit from professors who are both scholars and practitioners, but universities should offer to students something more than just professional skills. I would find it difficult to combine being both a good scholar and good practitioner. I chose academia, and I do my best to be competent in the different areas (teaching, publishing, administrative tasks). I’m afraid an attempt to combine academia with practice would be only possible at the expense of academic tasks, and I feel academia is my first responsibility. 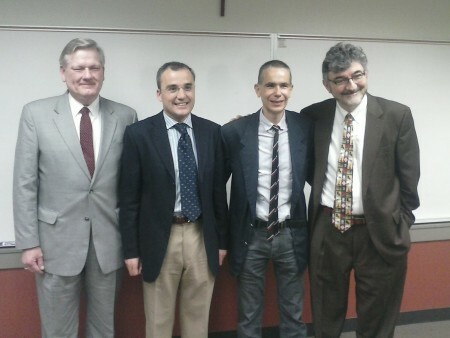 2013: At Professor Masferrer’s lecture “The Crime of Treason in the Origins of Spanish Constitutionalism” l. to r.: Professor Ray Rabalais, Professor Masferrer, Professor Markus Puder, and Professor Olivier Moreteau. 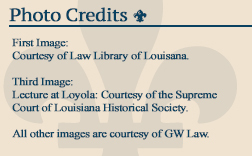 The lecture and luncheon, at the Loyola University New Orleans College of Law, were sponsored by the Supreme Court of Louisiana Historical Society. You have published extensively from a historical and comparative perspective on criminal law (including your Ph.D. thesis) and the codification movement. Do these remain your primary research interests? AM: Yes, the history of criminal law and the codification movement, both from a historical and comparative perspective, are the subjects of four of my books and quite a few articles and book chapters. My idea is to continue to work in these fields. Last year I edited a book on the influence of the Napoleonic code on Spanish codification. Now I’m editing two other books, one (in Spanish) which focuses on the foreign influences of the General Part of the nineteenth-century Spanish criminal codes, and another one (in English) tackles the French influence on the codification of criminal law in Europe. I’m also writing a book on the secularization of criminal law in the Western legal tradition. You are an exceptionally active scholar, balancing teaching, publishing, leadership in the academic community, and participation in scholarly meetings. Do you have a system for maintaining your high level of contribution to your profession? AM: I’ve never thought about such a system. The most relevant factor is probably that I like almost all things I do, although I do not do things just because I like them. From my youth I’ve always tried to make good use of time, to put all my energies into the things I have to do in every moment, and not to leave things undone. I enjoy reading, writing, and teaching, and it is enough for me to indulge in a bit of physical exercise (running, tennis, or paddle game, for example) to fully recover and resume my work. If family obligations permit, during the weekend I might spend time reading and writing. And I enjoy it doing it very much. I think the University – as an institution – and those who work in it should feel the responsibility of contributing to the enrichment of culture and human values in society, helping people to think for themselves, to be more critical and, therefore, less vulnerable. In addition to your scholarly writings, you have contributed many articles to newspapers. What topics have you addressed and why? And do you consider yourself in some ways a public historian? AM: I’ve been publishing articles in newspapers for the last decade. Most of them are related to law, legal history, legal and political philosophy, human rights, and current constitutional law issues. Two reasons explain my efforts to combine my scholarly writings and teaching with this undertaking. First, I think the University – as an institution – and those who work in it should feel the responsibility of contributing to the enrichment of culture and human values in society, helping people to think for themselves, to be more critical and, therefore, less vulnerable. Sometimes, universities are too much attached to political and economic powers, and this renders them incapable of thinking and maneuvering freely. Universities need political and economic support, but not at the expense of renouncing their raison d’être, namely, to cultivate the passion for knowledge and limitless curiosity – detached from a mere utilitarian perspective – and the common good of society. Some universities seem to prefer to become schools whose students receive just a technical training to get jobs, and the University, from its origins in the Middle Ages, is for something more than that. Second, writing articles for newspapers is a challenging enterprise that helps me to think more critically about what might be good – or better – for society, how the law should approach some trending issues, and what are – or should be – the social conditions for achieving a real constitutional democracy. And this activity challenges me because I need to write it in a few words, without footnotes, and in a way that ordinary people might be able to understand it. I’ve never considered myself a public historian, but it’s true that I’m a legal scholar (or legal historian) who tries to engage in public history. I feel part of the society and the world in which I live, and the knowledge of history, as Cicero affirmed, allows people and society to learn from the past, and build mature democracies in which respect and sincere dialogue flourish. 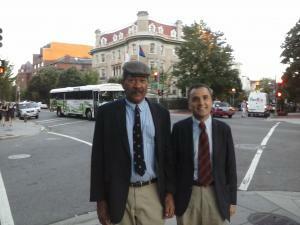 2014: With Professor Scott Pagel, Director of GW’s Law Library. You are President (and a founder) of the European Society for Comparative Legal History (ESCLH). Can you explain for us your work and role with the Society? AM: I agreed to stand as the first President of the ESCLH because I believed, and continue to believe, in its mission: the advancement of scholarship in all forms of comparative legal history. After five years I have found that my enthusiasm has not dimmed. The ESCLH has grown and developed: the ESCLH blog, three Biennial Conferences (Valencia 2010, Amsterdam 2012, Macerata 2014), the new ESCLH journal (Comparative Legal History), The Van Caenegem Prize, several ESCLH projects (Western Legal Traditions Casebook, by Hart Publishing; Comparative Legal History Handbook, by Edward Elgar Publishing), and, more importantly, the people, the scholars – of both law and history, the legal historians and comparative legal historians. This has been the most rewarding part of my tenure as President: to meet, learn from, and try to help scholars all around Europe and beyond. Indeed, the success of the Society has come from its members as well, and I have been particularly honored to work with inspiring scholars and wonderful colleagues, especially those on the Executive Council. I’ve always been convinced that I’ve not done much for the Society, and that it is not that difficult to be the President of a Society that is composed of wonderful members who are always ready to help and give support when needed. This is applicable to all, but especially to the members of the Executive Council (Matt Dyson, as the Secretary General, and the Vice Presidents: Jan Hallebeek – who was replaced by Phillip Hellwege last year; Dirk Heirbaut, replaced last year by Mia Korpiola and Remco Van Rhee), the current and former Treasurers (Juan Cañizares and Leandro Martínez), the editors of CLH (Seán P. Donlan, Heikki Pihlajamäki, Agustín Parise and Adelyn Wilson), and the bloggers (starting with the current and the former Webmasters – Flavia Mancini and Stefania Gialdroni – and then Frederik Dhondt, Seán P. Donlan, who had the idea of creating it some years ago). The Society is what it is thanks to these people. 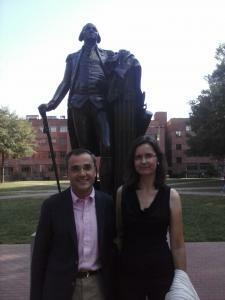 You received GW Law’s Richard & Diane Cummins Legal History Research Grant in 2014. Can you describe the focus of your research at GW, your presentation “The Secularization of Criminal Law in the Early Modern Age,” and how GW’s Special Collections fit into your general research plan? AM: Western criminal law tradition has gone through a gradual process of secularization which became particularly apparent in the seventeenth and eighteenth centuries. European and Anglo-American criminal codes showed this process by decriminalizing some behaviors which had been persecuted for centuries in most Western jurisdictions. Special Collections at the Jacob Burns Law Library, which preserves more than 35,000 important legal works from the fifteenth through nineteenth centuries, allowed me to work with many sources in a few weeks. Moreover, I could also use many French sources, because the Law Library’s French Collection is one of the largest collections of early French law in the United States, and its Incunabula Collection has about 170 titles. The work conditions were terrific. It reminded me of when I worked at the Max Planck Institute. I’m very grateful to the Director of the Law Library, Scott Pagel, and to the Legal History and Rare Books Librarian, Karen Wahl, and to all the reference assistants who helped me so much. Without their support I’d not have been able to work so much and make so much progress in the short period of time I spent there. While at GW, you had an idea for establishing a grant as a joint effort by ESCLH and GW to enable a junior legal history scholar to do research in Special Collections at GW. Although that program is still in the “thinking stage,” could you describe your idea? AM: The idea is twofold. First, after having worked with Special Collections at GW’s Law Library, I’m fully convinced that many non-U.S. scholars would be willing to work there if they were aware of the existence of such a wonderful collection. One might argue that many European scholars would prefer to go to Harvard, Yale, Stanford, or Columbia. That might be, but it’s too bad that out of ignorance they don’t consider going to GW, just because they don’t know that GW, for a legal historian, is a first-rate research option. It is, along with the Robbins Collection at Berkeley, among the top places to do research on European legal history or comparative legal history. Needless to say, GW Law is a great school and Washington, D.C., a wonderful city with an attractive living and working environment. Second, academic careers are becoming more difficult to pursue in Europe (as in the U.S.), and it’s not easy for young legal historians to get the needed positions to reach professional stability. Establishing a grant, as a joint effort by ESCLH and GW, to enable a junior legal history scholar to do research in Special Collections at GW would be very helpful for young legal historians, and contribute to the promotion of legal history, potentially throughout the world. 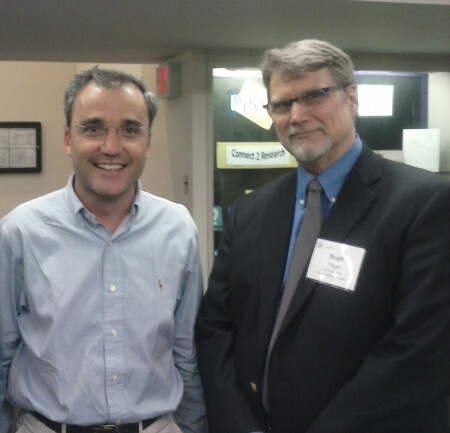 2014: With Professorial Lecturer in Law Richard J. Cummins, who with his wife Diane sponsors GW Law’s Richard & Diane Cummins Legal History Research Grant. [GW Law’s Special Collections] is, along with the Robbins Collection at Berkeley, among the top places to do research on European legal history or comparative legal history. Please discuss “Codiphobia.” And who coined this expressive word? With Professor Thomas Buergenthal With Professor Renée Lettow Lerner. 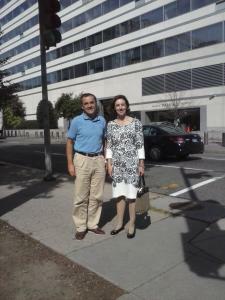 With Professor Francesca Bignami. 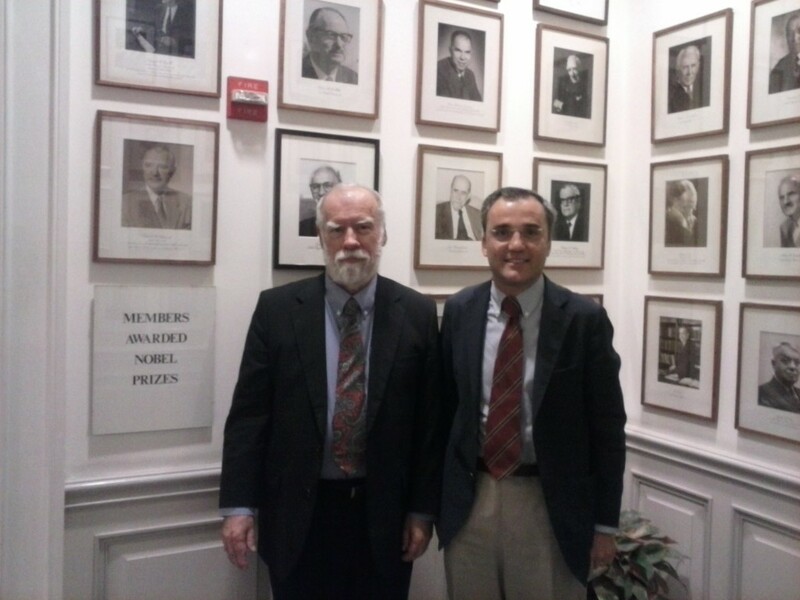 With Professor Robert Cottrol. Do you find that European scholars approach the study of legal history differently from American scholars? How are academic legal historians in Europe typically trained? From what training do you think legal historians from any country could benefit? AM: After finishing my Ph.D. I spent several months (the summers of 2000, 2001, and 2002) at the Max Planck Institute for European Legal History, and worked on the criminal law tradition of some Continental jurisdictions (mainly France, Belgium, Germany, and Italy). Besides the language, I felt comfortable with the sources and, more importantly, with the literature and legal doctrine, because they were quite similar to those I’d been using in my thesis. There I discovered the need for the comparative approach in legal history. My first stay in an Anglo-American jurisdiction was in May, 2004; I spent some days first in Oxford, and then in Cambridge. A year later I had the opportunity to work as Herbert Smith Visiting Professor at the Faculty of Law, University of Cambridge (February-July, 2005). I realized that sources, legal doctrine and literature, and handbooks were different. In many occasions, the starting point was case law (rather than legislative enactments – legal provisions and codes, for example); legal doctrine and handbooks revolved much more around case law than legislation, and legal education was in line with the primacy of case law over statutes. The first impression was that the common law system was completely different. After my stay in Cambridge, and particularly after spending a semester at Harvard Law School as visiting scholar, I changed my mind a bit: although the point of departure might differ, eventually both systems have more in common than it might seem at first glance. I don’t think it’s that relevant that whereas in common law jurisdictions case law has abiding force, and in civil law jurisdictions has a persuasive force. In practice, in both systems case law is a fundamental part of the legal system. Moreover, in common law jurisdictions, legislation is becoming more and more important, and is regarded today as the primary source of law. In Europe, most legal historians have a legal background. 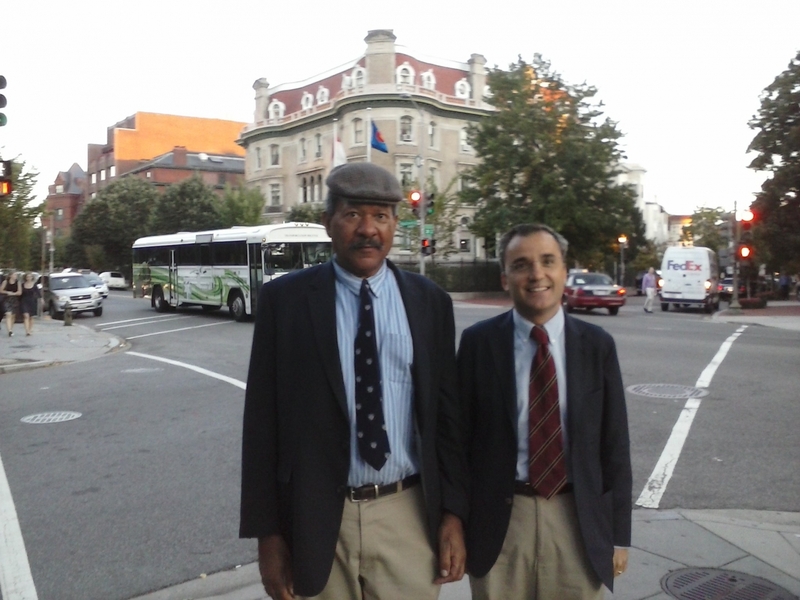 American legal historians might have a somewhat more diverse academic background. This may explain the more historical, narrative approach. In common law, legal historians (or just historians) focus notably on figures (mainly judges) and their influence in shaping legal institutions. In civil law jurisdictions, the legal history approach seems to be more institutional, although efforts are made to study legal institutions within their own social, economic, and political context. What advice would you offer to an aspiring legal historian? And what course of study would you recommend? AM: If someone feels attracted to devoting his or her professional career to academia, and more specifically, legal history, I’d say that that person should summon up every bit of strength to try it. It is very rewarding and satisfying to work as a legal historian if one feels called to it. As a good friend told me once, cheerfulness and persistence are two key factors to get what you want in life. The study of languages is highly recommended, starting with Latin (to read medieval and Early Modern sources), English (to be able to attend international conferences, to spend time abroad doing research, and to publish research in that language), and – if possible – others (French, Italian, Spanish, Portuguese, German, etc.) at least to read. Paleography would also be very convenient. As Cicero stated, “history is the teacher of life.” We have much to learn from history not just out of erudition, but – as I said – to learn from the past and to build mature democracies which guarantee social peace and justice. Why is legal history important? [i] 40 Arizona State Law Journal 173 (2008). [ii] 50 American Journal of Legal History 355 (2008-2010).